Adorn the foot of your bed or enhance your hallway with this fabulous, handcrafted, Western style bench. The bench´s well padded seat is designed without a back, and the seat is upholstered with rich, brown, full grain leather. The upholstery is hand tacked to the solid wood frame with lovely, gilt nails. The bench is adorned with a magnificent, curved, Spanish colonial style, front apron, and the apron is embellished with three cut sections of contrasting, brown, full grain leather. The leather is highlighted with brilliant, gilt nails hand tacked to all sides of the leather sections. The remaining portion of the base is finished in a luxurious, dark stain. 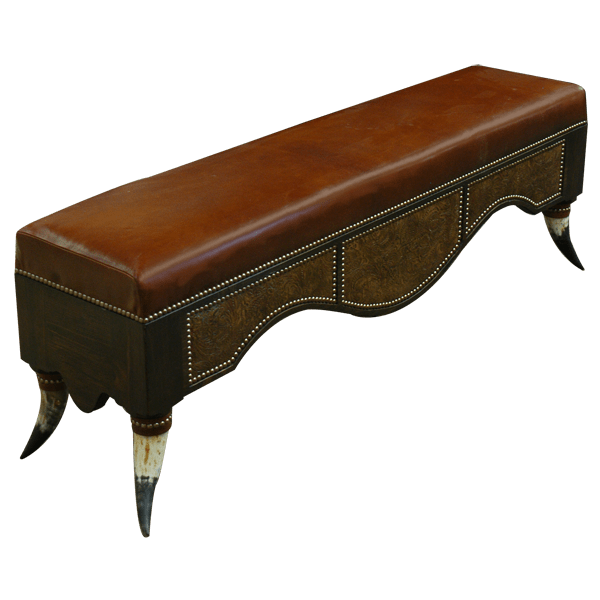 The bench rest on sturdy, inverted, steer horn supports, and the hilt of each horn is adorned with a leather strap hand tacked with decorative, gilt nails. The bench is made with the best, sustainable, solid wood available, and it is 100% customizable.